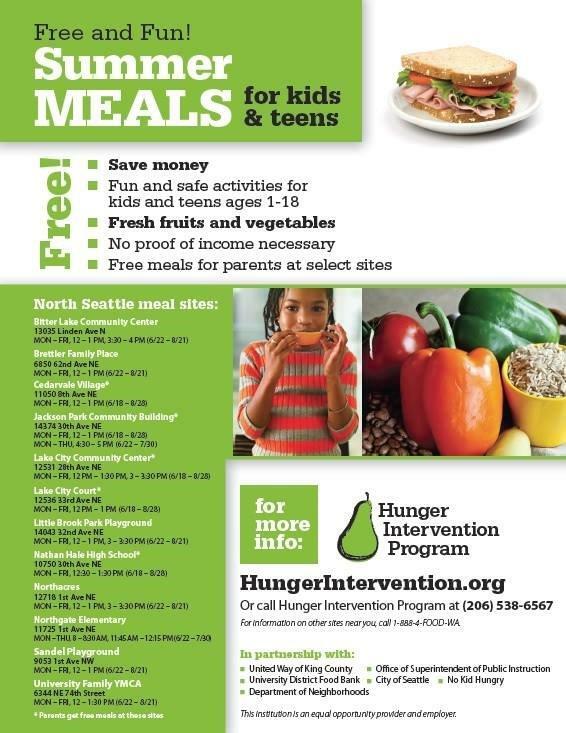 U District Food Bank is happy to continue our partnership this summer with Hunger Intervention Program, (HIP) to help end hunger in north Seattle. 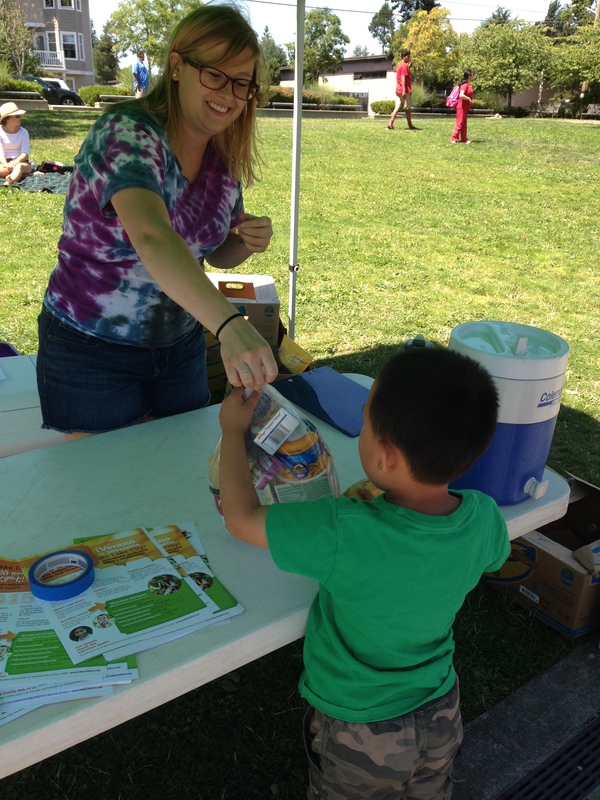 HIP provides many valuable services such as Senior Community Meals, Healthy HIP Packs during the school year, and five Summer Meal sites in the Lake City/North Seattle area. 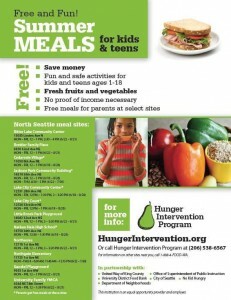 These meal sites provide a lunch and snacks for kids and teens Monday through Friday. HIP works with a vast network of volunteers to prepare meals for these sites and distribute them to the kids during the week. Aside from helping out at the meal sites, I also help to coordinate the weekend packs that are sent home with each child on Friday. Summertime offers many challenges for families with children who rely on free-and-reduced lunch and many kids are unsure when their next meal will be when they leave school on Friday. For the third year in a row, HIP and UDFB are able to help ease these concerns by providing weekend packs filled with healthy snacks and easy-to-prepare meal options for kids to enjoy over the weekend. We purchase the food through the Packs For Kids program and deliver it to the Lake City Presbyterian Church where it gets assembled into packs and distributed by HIP volunteers. With this team effort, we are able to distribute weekend packs to 130 kids every week! 2015 meal sites we are partnered with include: Cedarville Village, Jackson Park Community Building, Lake City Community Center, Lake City Court, and Nathan Hale High School. These meal sites also offer games and activities throughout the summer to keep kids busy and engaged. By spending time in these communities, I’ve been able to see a lot of the same kids at distributions almost every day and getting to laugh and play with them is so much fun! They are so thankful for what we have to offer, and we are even more thankful that they offer us joy and laughter every day. See the attached flyer for the meal site distribution schedule! 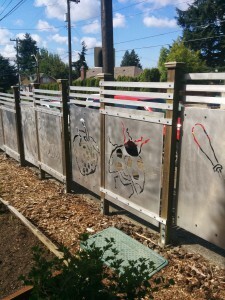 Nestled between apartment complexes and a pumping station by the University of Washington campus are 500 square feet of garden space that make up the UW P-Patch. 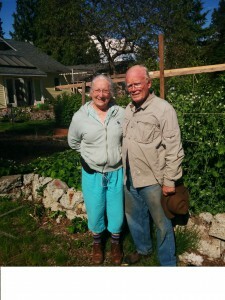 Kathy Krogslund has served as coordinator of the P-Patch for over 30 years. It contains more than 60 plots with around 80 gardeners, at least ⅓ of which have been working their plots for five or more years. Because of its affiliation with the University, the P-Patch is a fluid system with students graduating and new students coming in frequently. Kathy sees this as an advantage and enjoys the new enthusiasm this brings to the gardens each year. 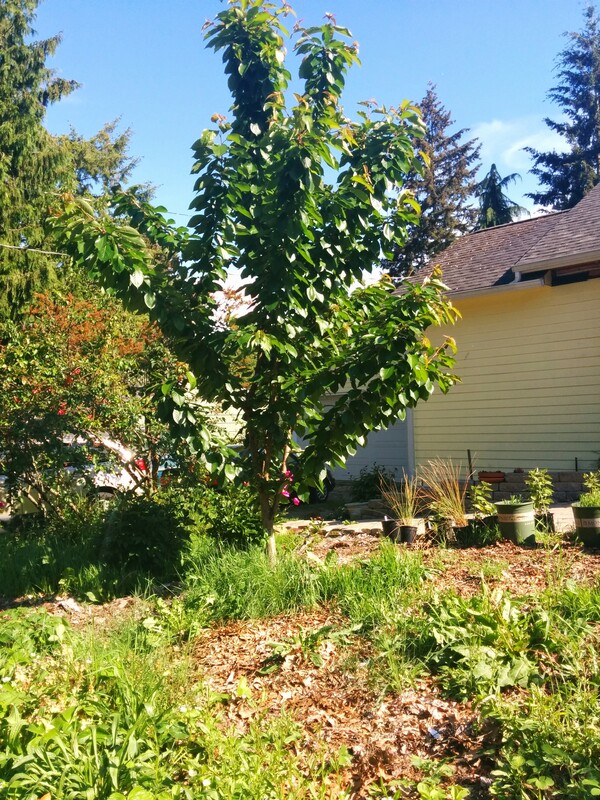 She works primarily with a team of four to five interns each year from the UW College of the Environment who receive class-credit for working in the P-Patch. For Kathy, this offers a great opportunity to “foster that giving back to the community makes you feel good.” Her interns are also encouraged to visit our Food Bank to learn how we operate and see how the vegetables they’ve grown are received by customers. 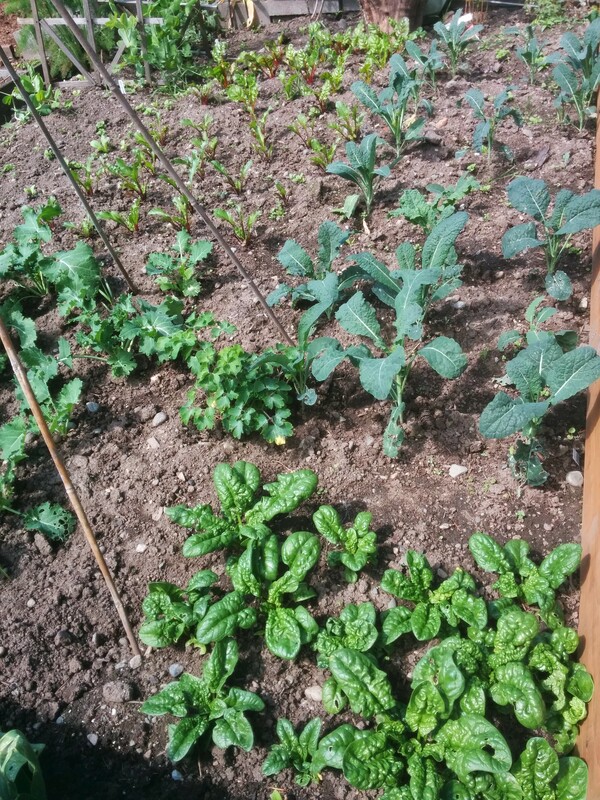 The P-Patch grows crops like sweet salad greens, beets, green beans, tomatoes, cucumbers, and summer squash. They harvest on Tuesday evenings and volunteer drivers deliver produce to the Food Bank on Wednesday mornings. 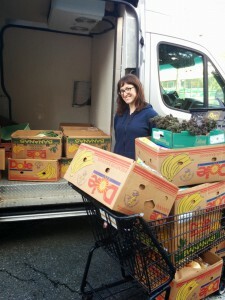 Her goal for this season (June – October) is to increase produce donations to 500 lbs. Most years average between 300 and 500 lbs. Kathy recalled a story from a few years back when a new gardener at the patch approached her to thank her for her work at the P-Patch. After losing her job during the economic recession, she turned to the Food Bank for the first time and remembered how excited she was the day fresh tomatoes came in and how good they tasted. It’s stories like these that remind Kathy how important the garden is for our community. When asked how the P-Patch has changed over time, she responded, “People recognize the importance of the P-Patch now more than ever.” She attributes this to the evolution of farmers markets, the local food movement, and a push for low-income and refugee families in Seattle to have access to fresh produce. Kathy believes this gives the P-Patch political clout and ultimately gives value to the city. “We’ve all marched together on this,” she says. 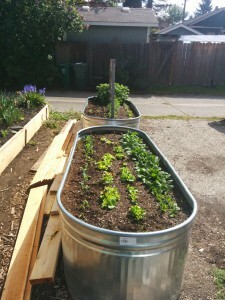 If you have spare gardening supplies, the P-Patch can always use hand tools for weeding such as trowels, buckets, plastic berry containers, paper bags with handles, and ziplock bags for packaging produce. 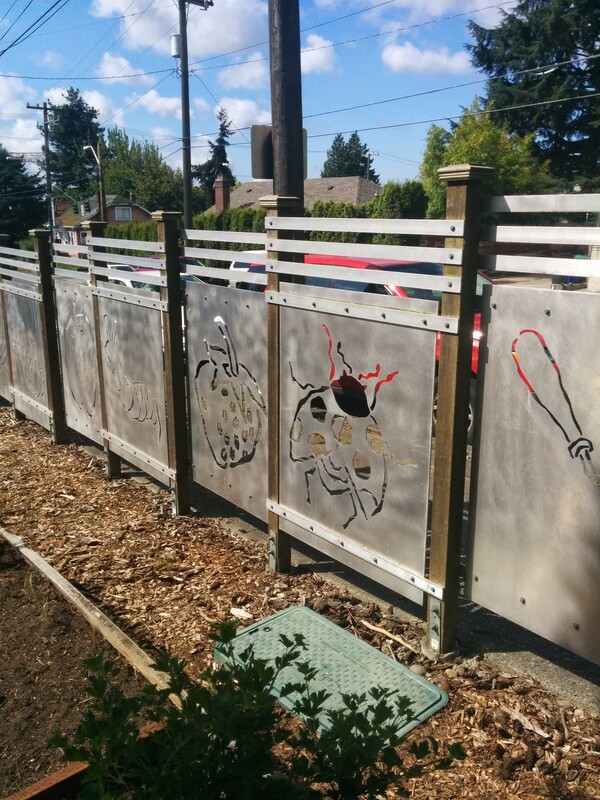 All donations can be brought to the P-Patch shed, located at 4009 8th Ave NE. For more information on work parties or donations, send Kathy an email at kkrog@u.washington.edu. 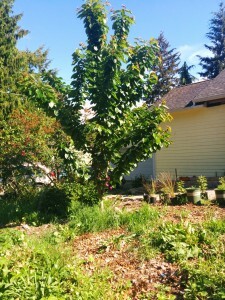 Lar and Dorothy Fritchs’ home in the Lake City neighborhood is surrounded by fruit trees, berry thickets, rows of peas, strawberries, garlic, lettuce, and more. Since 2008, they have expanded their gardens to around 900 square feet in cultivation. For the past three seasons, they’ve planned for overabundance and donate to the Food Bank whatever they can’t eat themselves. 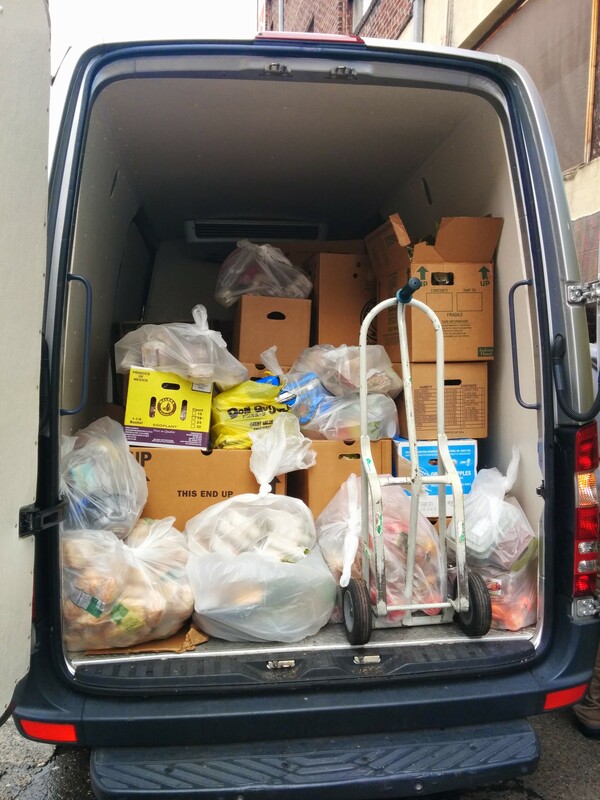 In 2014 they were able to offer us 150 pounds of fresh produce. 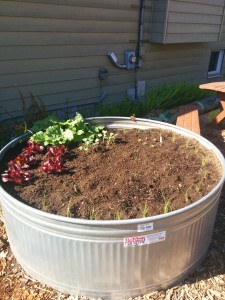 Lar’s motivation for growing food can be explained by a simple philosophy: “I don’t like lawn,” he says. 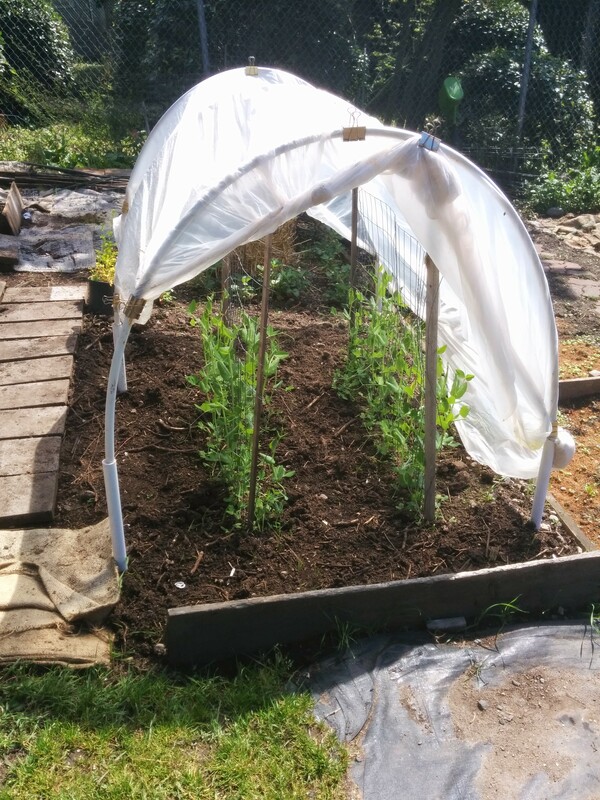 They have always enjoyed growing vegetables and the impact it can have in their community. 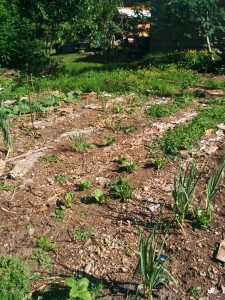 Their vision for the future is to expand the garden further, removing any traces of lawn, and get more people in their neighborhood involved who are interested in growing food but don’t have the space. Dorothy’s goal is to “change the neighborhood one child at a time by getting them hooked on the taste of fresh vegetables.” When neighborhood children pass by the house, Lar and Dorothy offer them fresh produce, hoping the children will then go home and tell their parents they want their own garden. 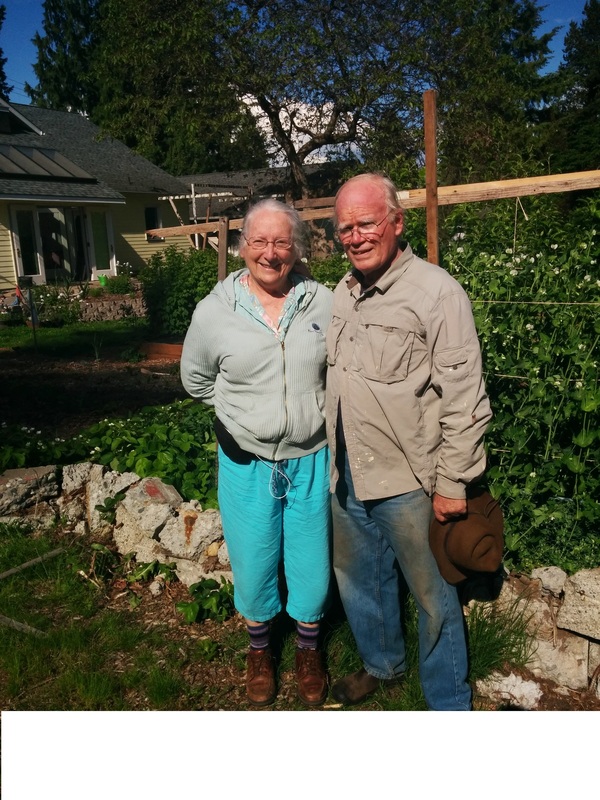 Lar and Dorothy’s commitment to growing food as a means of shaping their community is clear. Thanks to Lar and Dorothy and all our supporters who allow us to offer the best in locally grown fresh produce to our customers! Kailin is our Operations Manager and is responsible for food recovery from our partner grocery stores. Wednesday is her busiest day for pick-ups, so I accompanied her on her route which includes U Village QFC, Wedgewood QFC, Wedgewood Safeway, Viewridge PCC, and the Roosevelt Trader Joes. Kailin has established a good rapport with each store’s employees and knows many of them by name. They recognize her immediately as we walk in, say hello, and direct us to different parts of the stock room and freezer where donations of meat, produce, bread, dairy, and nonperishable items have been set aside. “There’s a whole cart full of strawberries for you in the back!” one produce employee excitedly reports. Kailin has found that when employees are aware and understanding of our work at the Food Bank, they become more conscientious of setting aside donations for us and ensuring better quality control. 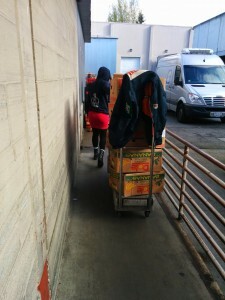 I can barely keep up as she dashes around to each department, effortlessly lifting 50 pound boxes of produce into shopping carts. We also check the stores’ donation bins which are emptied weekly and then load up our refrigerated van with all the donations and head back to the Food Bank. The pickups are often unpredictable and she’s never sure exactly how much will be available at each store. Her days are also full of surprises, like when a store’s cooling system broke down and they called her to come pick up the entire contents of their coolers immediately. No matter the situation, Kailin takes everything in stride with a positive, enthusiastic attitude and expert van maneuvering skills. We are so thankful for Kailin and all of our partner grocery stores! The produce section of the Food Bank will soon feature fresh rhubarb, colorful leaves of swiss chard, and sharp, lemony sorrel. 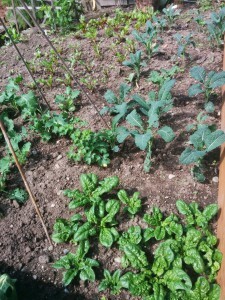 These will be the first of the bounty of crops grown for us from the Roosevelt P-Patch Giving Gardens this season. 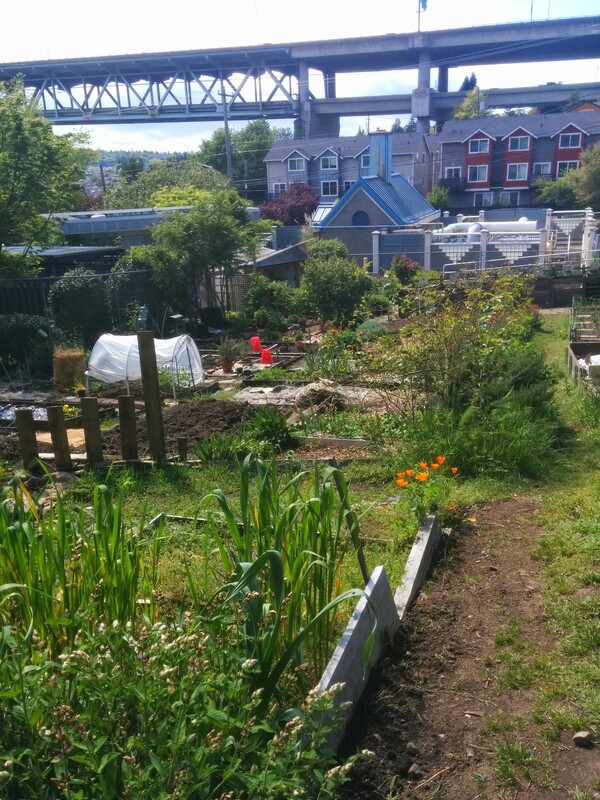 The Roosevelt P-Patch Community Garden, located on 12th Ave and 71st St., is home to one of several giving gardens where vegetables are grown for our Food Bank. Last year they donated 143 pounds of produce for our customers. 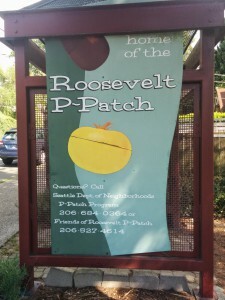 The Roosevelt P-Patch began 11 years ago when surrounding neighbors wrote a grant to the City of Seattle to convert the previously blighted space into a community garden. 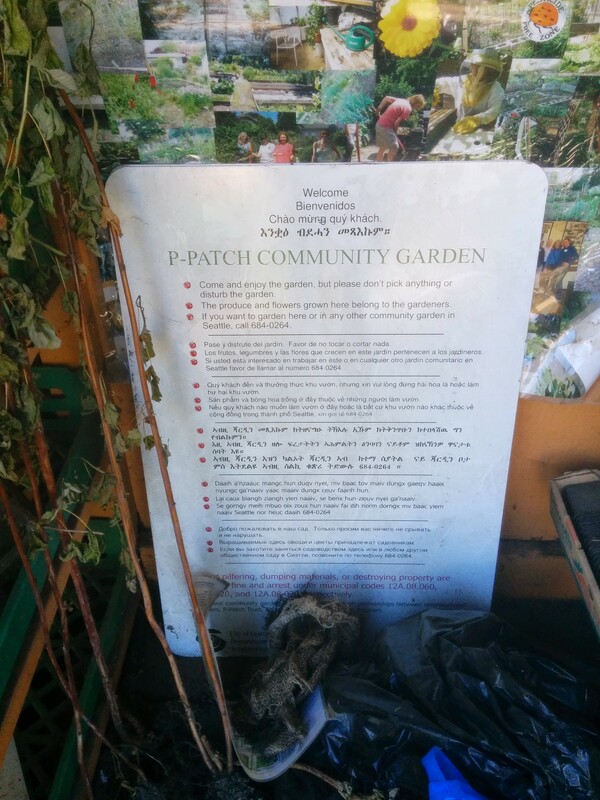 Along with the contributions of an anonymous donor and a core group of 10 nearby residents, the P-Patch was born. This group began the initial work of digging trenches for water lines, building a toolshed, and creating raised beds. According to Renee Davis, Giving Garden Coordinator at Roosevelt, the development of the giving gardens has been a real community effort. Maple Leaf Ace Hardware Store has donated hoses and offers a 10% discount on all supplies purchased for the gardens. The Roosevelt Whole Foods provided meals during work parties last year and has consistently served as a great sponsor in expanding the giving gardens. This year, Renee has switched over from raised beds to large metal feed tanks for the giving gardens because they are sturdier and easy to maintain. 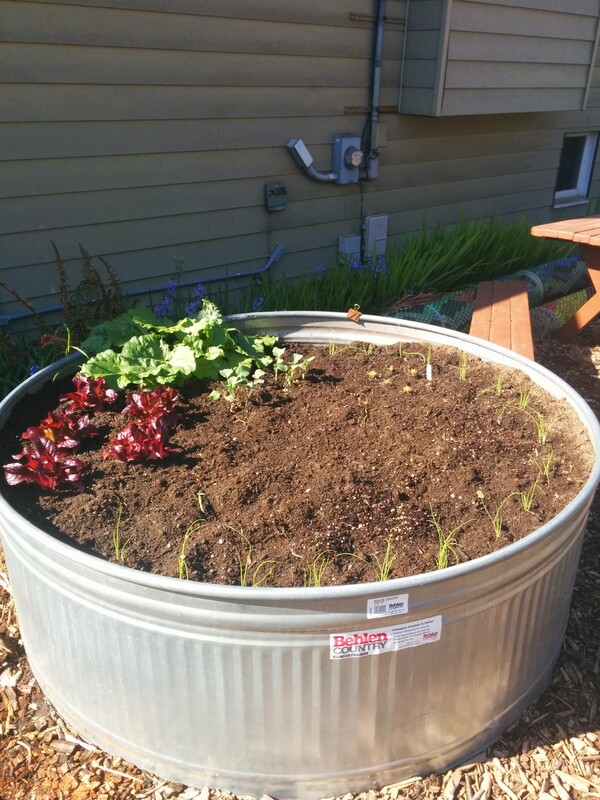 The majority of plant starts are donated by Solid Ground and seeds are provided by the P-Patch program. This season, Renee plans to grow beets, bush beans, snap peas, lettuce heads, squash, and more.